Dr. Terrence D. Anderson graduated with honors from the United States Naval Academy in Annapolis, Maryland. He attended medical school at Baylor College of Medicine in Houston and completed both his internship and residency at Naval Medical Center San Diego in California. Dr. Anderson went on to complete his fellowship in pediatric orthopedic surgery and scoliosis, with an emphasis on the treatment of hip pain and injuries, at the Texas Scottish Rite Hospital for Children in Dallas. Board certified in orthopedic surgery, Dr. Anderson has clinical interests that include scoliosis, fracture care, patellar instability, osteochondritis dissecans (OCD), ACL ruptures and hip preservation in children and young adults. He specializes in pediatric orthopedic surgery. Dr. Anderson specializes in pediatric orthopedic surgery. If surgical treatment is needed, he employs either open or arthroscopic techniques to treat hip conditions including labral tears, femoroacetabular impingement (FAI) and hip dysplasia. He was an All-American center on the football team, in college, which gives him a unique perspective while treating young athletes. 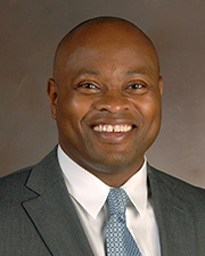 An assistant professor on the faculty of McGovern Medical School at UTHealth in Houston, Dr. Anderson is a member of the American Academy of Orthopaedic Surgeons, the Pediatric Orthopedic Society of North America and the Society of Military Orthopaedic Surgeons. His research interests include various areas of hip preservation, pediatric musculoskeletal conditions and sports medicine. Residents of Missouri City, Dr. Anderson and his wife have two sons. They enjoy exploring the Houston area, college football, and church activities.